Still smiling, heart bursting, always a proud Jayhawk! I’ll admit, we’ve been spoiled in the past. Filled with expectations and on occasion, “hard” on our team. However, this year fans watched, rallied and cheered on a team that was highly questionable compared to past teams and the season was initially dubbed a “rebuilding” year. Nevertheless, the Jayhawk faithful rearranged their schedules to watch games, purchased additional cable/satellite packages to see them play on networks like ESPNU and donned their KU garb to support the team. And something wonderful happened…we WON! And we kept winning–games that polls, commentators, and basketball insiders said the Jayhawks couldn’t win. That’s when the fun really started! Around town, at work, in schools, and even before morning worship on Sundays, fans were talking about this unbelievable team. We were bonding over the near heart attacks and close calls. We were beaming at Thomas Robinson’s amazing season. We were marveling at the transformed Jeff Withey who showed up to play this year (thank you Danny Manning and Andrea Hudy!) We were developing an affection for Tyshawn Taylor during BOTH his ups and his downs. KU fans were making room in their hearts for less familiar faces on the court–Elijah Johnson, Travis Releford, Kevin Young and many others. Basketball fans were (re)discovering this team. We were falling in love all over again with the Jayhawks…and isn’t that how love happens…when you least expect it! The thing I have enjoyed the most has been the “love fest” we saw among fans during the NCAA tournament. In some ways, the tournament was like undertaking a strenuous new exercise program. There were heart bursting moments, heart attack inducing first halves, heart warming game finishes and ultimately a heartbreaking loss. It was a real workout! And post game, the sentiment that ran through everyone from the coach and players, to alumni and fans was true gratitude. Coach Self gushed about his team and the love he has for each member. The players spoke of each other like family (not just family, but a family that actually loves each other.) Sports writers went on and on about how this season exceeded the expectations of so many. And everybody talked about gratitude. Gratitude for the effort the team put into the game, gratitude for the talent of the coach and coaching staff and gratitude for the overall “ride.” This is not a “cinderella” story, the history of the KU basketball program is anything but that. This is a story of finding $20 dollars in your pocket–you didn’t expect it, you don’t deserve it, you don’t know where it came from or why, but, man, isn’t it AWESOME? What an amazing season…and just like that it’s all over. Some people will read this and think I’m going over the top (and those who know me well, know that I’m known for such things.) Still the whole experience reminds me of something I read once about tribal affiliation. Many think that tribes are part of the past. We’re civilized now, right?. Advanced even. Yet our thinking, our brain wiring retains some ties to ancient society Years ago our survival depended upon being part of a tribe. The tribe was our family. It was a source of pride. People were grateful for their tribe. Nowadays, people equate tribes with regions of the country, brand loyalty, and of course, sport team affiliations. Today’s tribalism is a source of social recognition, socialization and symbolism. 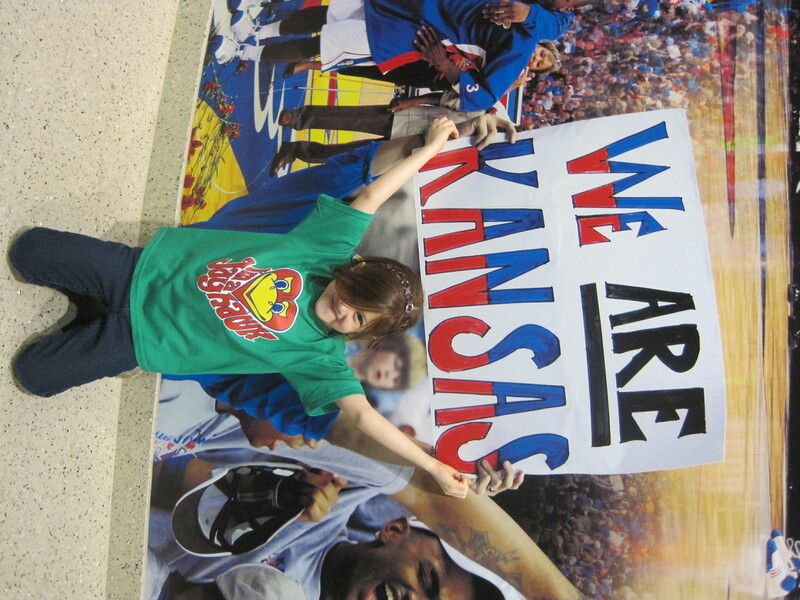 For myself, being a Jayhawk is not just about belonging to the tribe of my family (yes, we’re ALL Jayhawk fans! ), but it’s a reminder of my personal opportunity to grow in education and life knowledge. The time that I spent in Lawrence taught me so much about who I am and what I believe. It prepared me for so many different experiences. It opened doors and took me places that I couldn’t have imagined. I’m part of the Tribe Jayhawk. And so here’s where my personal gratitude to a school that I love comes full circle with the gratitude that I feel has infiltrated the hearts of so many Jayhawk basketball fans this season. In this life, nothing is promised. In the big scheme of things, college basketball (and sports in general) are like the wind—fleeting. So when you have the opportunity to see gratitude (even if it’s in something as commonplace as sports), I hope that you’ll recognize it. More than that I hope you make gratitude part of your every day life. Nothing makes my heart sing like seeing those around me recognize the blessings in their lives–they are abundant if you just take a moment to look for them. I don’t know what next’s year basketball season will be like. Early reports show that the Jayhawks will have a good team. I know that there are many fans who EXPECT the KU basketball team to be top-rated every year. Regardless of early predictions, I hope that we will remember this season–and the spirit of gratitude that it brought with it! A gratitude that made the Jayhawks a better team and the rest of us better fans. Still smiling, heart bursting, always a proud and grateful Jayhawk!